Regular Personality Application + Mirror - What Fantasy Creature of Myth Are You? What Fantasy Creature of Myth Are You? Do you feel that your zodiac signs fit you or not? Not particularly. Describing my personality: Serious, kind, sweet, gentle, sarcastic, cynical, intelligent, independent, tender, diligent and quiet. The only other thing I can think of saying is that I'm seen as a mixture between a minx and the stereotypical 'strong and silent' type. As for weaknesses, I can be stubborn, stoic, and too hardworking at times. Also, this is apparently my personality 'type'. Idealists, as a temperament, are passionately concerned with personal growth and development. Idealists strive to discover who they are and how they can become their best possible self -- always this quest for self-knowledge and self-improvement drives their imagination. And they want to help others make the journey. Idealists are naturally drawn to working with people, and whether in education or counseling, in social services or personnel work, in journalism or the ministry, they are gifted at helping others find their way in life, often inspiring them to grow as individuals and to fulfill their potentials. Idealists are sure that friendly cooperation is the best way for people to achieve their goals. Conflict and confrontation upset them because they seem to put up angry barriers between people. Idealists dream of creating harmonious, even caring personal relations, and they have a unique talent for helping people get along with each other and work together for the good of all. Such interpersonal harmony might be a romantic ideal, but then Idealists are incurable romantics who prefer to focus on what might be, rather than what is. The real, practical world is only a starting place for Idealists; they believe that life is filled with possibilities waiting to be realized, rich with meanings calling out to be understood. This idea of a mystical or spiritual dimension to life, the "not visible" or the "not yet" that can only be known through intuition or by a leap of faith, is far more important to Idealists than the world of material things. Highly ethical in their actions, Idealists hold themselves to a strict standard of personal integrity. They must be true to themselves and to others, and they can be quite hard on themselves when they are dishonest, or when they are false or insincere. More often, however, Idealists are the very soul of kindness. Particularly in their personal relationships, Idealists are without question filled with love and good will. They believe in giving of themselves to help others; they cherish a few warm, sensitive friendships; they strive for a special rapport with their children; and in marriage they wish to find a "soulmate," someone with whom they can bond emotionally and spiritually, sharing their deepest feelings and their complex inner worlds. Likes: Tea, love, nature, animals, kindness, hockey, laughter, quiet time, reading, classical music, documentaries. Dislikes: Loud, boorish, classless people. Favorite Place: Anywhere in nature. What are you good at? Studying, reading, memorizing, music, volleyball. What are you not so good at? Nothing. I'm good at anything I set my mind to. Describe Yourself: Didn't I do so above? How do you view love? If applicable, what is your current relationship like? Love will happen when it happens, because love is all around. And that's none of your business. I keep my private life private. Are you more trusting or cynical? I pretend to be cynical but I'm actually very trusting. What are you future aspirations? To be happy, to find love. If you could change one thing about yourself, what would it be? Do not make obvious references to mystical creatures here, i.e., don't say that you wish you had dragon wings. I wouldn't. Faults build character. Do you have a quote or philosophy that suits you? 'Convinced myself, I seek not to convince. '- Edgar Allan Poe. Knowledge or Strength: Knowledge is strength, and vice versa. Lover or Fighter: I believe you need to fight for love. Popular or Not: I am popular, but not by trying intentionally. Determined or Laid Back: Determined. 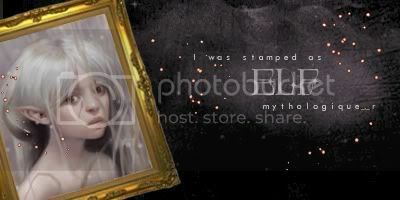 Tags: stamped: elf!, stamped: sprite! personality; agree with thr above vote for elf. Personality: My first impression was elf, but I can see a bit of fallen angel. For your personality, there was something about your calm, stoic personality that reminded me of a centaur, but I think that your optimism and ideallism is more like an Elf than a centaur. And for the mirror, I definitely see Sprite for you!